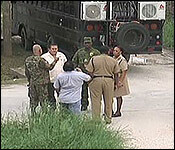 And while the unravelling of that case could bring down a cop who's made a lot of enemies in the streets, police have much bigger plans to bring crime under control in Belize City. Tomorrow, the Minister of State responsible for Police, Elodio Aragon and the Commissioner of Police, Allen Whylie will have a Press Conference to announce a major police operation targeting the southside which will roll out tomorrow. This comes out of strategy sessions held yesterday and today with the senior command and all senior officers. 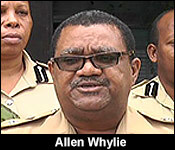 The meetings were held at the Queen Street and Raccoon Street police stations. We understand that apart from this operation, coming out of these strategy session there will also be personnel adjustments. 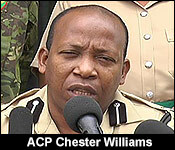 Reports say that includes bringing ACP Chester Williams back to the southside - not as a commander - but as mediator. 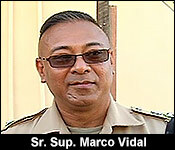 According to unofficial reports, Senior Superintendent Marco Vidal will remain as southside commander, but Williams will be tasked to initiate or resume dialogue with the various gangs. Vidal had completely rejected this model when he first took command - saying that the Williams and Dianne Finnegan should fall in with the CYDP effort, or step out of the mediation business. Considering the fact that Williams recently threatened Vidal with a lawsuit, it will be interesting to see how this plays out. 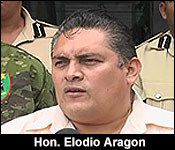 Notably also, we understand the police department is now firmly under the ministerial purview of Minister of State Elodio Aragon. This is the result of a Cabinet directive earlier this week - when it appeared that the Minister Wilfred Elrington was working at cross purposes with his minister of state. Elrington - as we understand - is now mostly out of the picture, and Aragon has taken the reigns. "The Belize Police Department has launched a special anti-crime operation code name "ACT" which basically means "Addressing Crime Together"." And today that meant installing these command centers in the St. Martin's, Collet and Jane usher Areas. They insert a fixed police presence in these gang ridden and violence torn communities. Today we saw police blanketing the different area on active patrol, their presence, perhaps both ominous and reassuring. 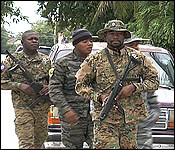 The GSU with their trademark MT-9 rifles, the special Patrol Unit in their signature camouflage outfits and other regular units on patrol. 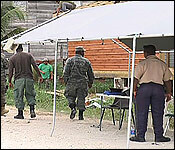 "This operation will be targeted and focused driven by intelligence and is composed of personnel of various operation units of the Belize Police Department including the anti-narcotics unit, the Gang Suppression Unit, the Special Patrol Unit, the Special Branch, the Joint Intelligence Coordinating Center, Crimes Investigation Branch, Special Assignment Team, Mobile Interdiction Team as well as personnel of Eastern Division." 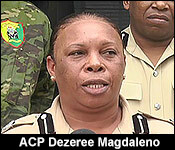 "This operation will the targeting those gang members and leaders who are behind these shootings and murders. We know the members of the gangs. We know the players involved in this spate of shootings and murders and this operation will be focusing solely on them." "We will be in their faces. We will be in their homes and we will utilize all available laws to arrest them." "We will not say specifically what assets we have on the ground. But for the law abiding citizens' comfort every corner you turn you will see police officers and the criminal will be complaining that we are there in their face." That was a recurrent theme of today's press conference - to swarm these areas with police to make it virtually impossible for illicit activities - such as weed selling - to occur. "You will see high visibility of police officers day and night and we trust that the community will work with us." "We will target, disrupt and arrest known gang members and their leaders. We will proactively target individuals and groups engage in the trafficking of illicit drugs, firearms and ammunition. We will proactively target individuals and gangs involved and engage in street level guns and drug crime and we will target known criminals through increase stop and search operations as well as house searches." But what about regular law abiding citizens in these communities? "Law abiding citizens in the areas of operations that they have nothing to fear from this operation. They have nothing to fear from the police." "To those law abiding citizens we ask to be patient and forgiving if you get entangle in any of our check points or what have you. We are in no way looking or seeking to target law abiding citizens." "We are not out there to beat up people. We will work within the laws that we have and any wrongdoing if substantiated will be addressed, but we are dealing with some very serious criminals. We are dealing with serial killers and we will be in their faces and I will make no apology for the police being in their faces." "If you see something please say something to me. The cell phones that are activated for this purpose, for this activation, what is a Digicell, the number is 634-5168 and the SMART number is 660-1164. I am assuring the public that the information you share with me would be kept confidential." "The main purpose of the mediation and intervention is to be able to defuse the tensions between mediations and interventions. Yes while we have the tough component of the operation, we also want to be able to provide that avenue for those persons who would want to come to the table and make a change." "I will tell you sir that there will be no compromising and there will no easement of the enforcement of the laws. If someone is found with something they will be arrested and charged. You have to understand that the mediation is not the mediation with the police for people to break the law. The mediation effort that will be lead is for the rivalling parties and the affecting parties to have an opportunity to sit down with a neutral person or a neutral team and to try to work out their differences. 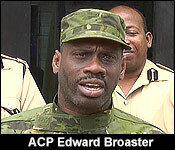 It's no mediation to say you break the law and the police will look the other way, will not happen." "You have the carrots on one hand you have the stick on the other. The issue of mediation is not per say to give people break to commit crime. Is basically and avenue that has created to ensure that young people who have conflict with each other's, that they can come to a table to mediate." "The ministry of home affairs is supporting this operation 100% and we have thus far acquired 15 new vehicles to assist in this operation." "After January we will come up with another plan and we will continue to plan and until we get it." It's left to be seen then if this perpetual police presence can create perpetual peace. Again, those numbers to call or text with information or complaints are: 634-5168, and 660-1164. The only notable absence at today's cop-kumbaya was Southside Eastern Division Commander Marco Vidal - who, we are told, was absent due to illness. And while the new operation can be cynically interpreted as just more boots on the ground - as we mentioned, there's also the mediation element. 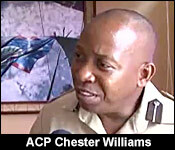 It's left to be seen how that will be balanced against pure police force, but according to ACP Williams - there is another element. He says police plan to reduce the supply of marijuana to the city - the same high grade marijuana which is fueling the gang wars. 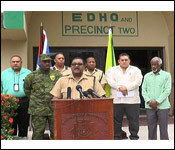 "One of the purposes of the operation is to see how we can reduce the importation of marijuana into the city. That itself will create some scarcity where marijuana is concerned and that should, to some extent, diffuse certain aspect of the tension; it is time now to put it to an end. I always say to them, it takes a fool or a coward to pick up a gun and shoot but it takes a real general to end a war."